The chocolate chip cookie is a classic. It’s a biscuit recognised across the globe by one and all. Synonymous with childhood memories and late night snacking, it’s nothing short of a masterpiece. Re-creating a masterpiece is no mean feat. But Battle Oats have baked a satisfyingly soft cookie, stacked with enough chocolate chips to send your taste-buds in to raptures. So, dismiss the daydreams of cookies at night and delve in to cookie dreamland by enjoying Battle Oats cookies on the go, all day long! Ready to eat 1 serving. Battle Oats can be consumed in a variety of ways; from being a great grab n' go breakfast, something to consume during a long bike ride, post exercise, or as a nice accompaniment with a hot brew. Pea Protein (17%), Chocolate Chips With Sweetener (14%)(Sweetener (Maltitol), Cocoa Mass, Emulsifier (Soya Lecithin), Cocoa Powder, Natural Vanilla Flavouring), Chicory Root Fibre, Sugar, Gluten Free Oat Flour (14%), Glucose Syrup, Vegetable Oils (Palm Oil, Rapeseed Oil)), Brown Flaxseed , Gluten Free Oats (4%), Concentrated Fruit Juice (Grape Juice, Starch (Rice)), Natural Flavourings, Raising Agent (Sodium Bicarbonate), Sea Salt, Colour ( Plain Caramel). 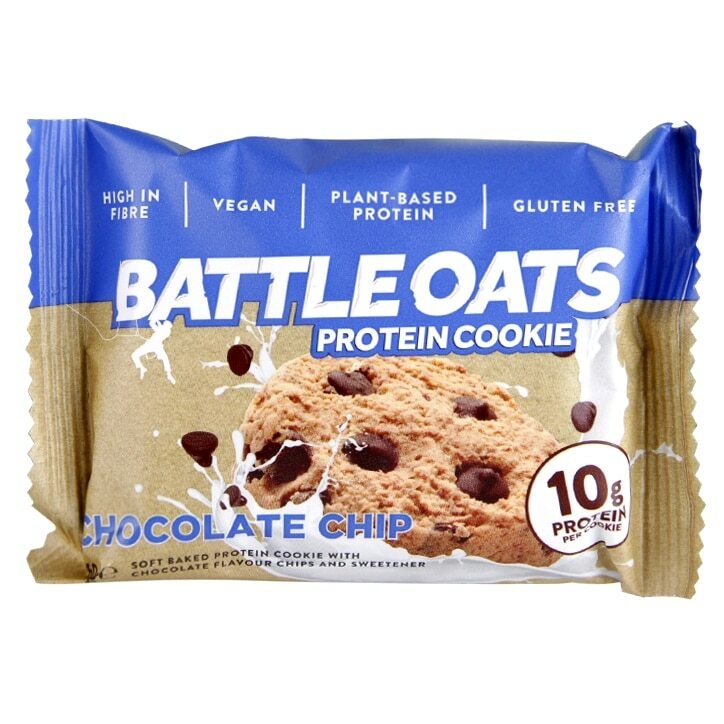 Battle Oats Chocolate Chip Cookie is rated 4.5 out of 5 by 4.